The Schtalbaum` s hospitable house is receiving guests arriving for Christmas. 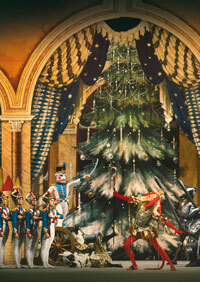 Drosselmeyer is busy by the decorated Christmas tree, preparing many wonderful practical jokes. His nephew Franz is watching him. Guests start filling the drawing room. Funny games begin, with everybody present participating, including, of course, Masha, the Schtaldaum`s youngest daughter. Unexpectedly, in the middle of the fun, a mysterious stranger comes out of the big old clock and introduces himself as the Kind Magician who has arrived from the beautiful City of Sweets called Confiturinburg. He gives presents to the excited children and starts a marvelous story about the wonderful city, its inhabitants and about the Beautiful Prince of Confiturinburg. One of the prince`s favorite occupations are strolls in the vicinity of the palace on the Rig Marzipan swan accompanied by two lovely roses, who are ladies-in-waiting of his mother -the Sovereign Princess. The children are listening to the story with obvious interest, and only Franz reacts differently. His suspicious glance indicates that a guess starts taking shape in his mind. In the meanwhile the Magician is working wonders. The time comes to return to Confiturinburg, and the Magician says good-bye to the children and start towards the clock. Franz grabs the Magician`s bag and takes the dark glasses out of it thus revealing the Stranger`s identity. It is, of course, the kind Uncle Drosselmeyer. The children scold him for the deception and, taking the Pirate and the Snow Queen dolls from his bag with them, run to other rooms. Masha notices the doll left behind by the bag. « It`s the Nutcracker» says Drosselmeyer. Shortly afterwards Franz appears in the drawing room with the Pirate under his arm. He chooses an appropriate moment and snatches the Nutcracker from his sister. To prevent a quarrel between the children. Drosselmeyer tells Masha and Franz a fairy tale about the powerful sorcerer Myshild and the Beautiful Prince of Confiturinburg turned into the ugly Nutcracker by the Seven headed sorcerer who occupied the City of Sweets. Drosselmeyer continues his fantasy and tells the excited Masha that it will be her who, at midnight, will be able to help the Nutcracker kill Myshild and thus become the Beautiful Prince again and return to Confiturinburg, where she will be given, as a sign of appreciation, a precious gift- a beautiful diadem made of fruit caramel by the best jewelers of Confiturinburg and inlayed with the best in the world fruit drops. Franz, unlike Masha, does not believe his uncle and, taking the Myshild doll with him, leaves the drawing room. Masha remains alone, deep in thought about how she will manage to overcome the terrible Sorcerer. The adults return to the drawing room and dance grossfater. The clock strikes. It`s time for the children to go to bed. Masha`s nanny takes her to the bedroom. Masha returns to the drawing room. She was not able to learn from Drosselmeyer how she will manage to help the Prince defeat Myshild. She sits down on the sofa think it over and falls asleep with the Nutcracker in her arms. Immediately the magic begins. The toys that were standing still under the Christmas tree come to life. Awful mice- the Sorcerer`s Loyal servants- appears and begin to cruelly destroy the poor dolls. Seeing Myshild, Masha with the help of the Snow Queen hides in the fortress. Brave soldiers march out of the fortress, and a real battle starts in accordance with all the strategic rules. Nutcracker is, of course, an active participant of the battle. Without a shade of doubt he enters into a duel with the treacherous Sorcerer. At the decisive moment of the combat Masha runs out of the fortress and throws a candle holder at Myshild. Nutcracker pierces the Sorcerer with his sword. The evil is defeated. The Beautiful Prince standing over Myshild`s dead body comes to Masha and lays at her feet the military trophy- Myshild`s magical rod, a symbol of former power of the defeated enemy. The Snow Queen appears and invites Masha and the Prince who have already become friends to her Kingdom. After a short stay there they go to Confiturinburg. Masha and the Prince arrive in the City of Sweets. But, as it appears, the magical power of the defeated Myshild is still in force. Mice are still in charge in Confiturinburg. Then the Prince breaks the Sorcerer`s rod and eventually frees the town of the greedy occupants. A grand celebration of the Prince`s return and the liberation of Confiturinburg begins. The Sovereign Princess-the Prince`s mother- thanks Masha for her help and gives her a beautiful gift- a gorgeous diadem, and invites her to be the guest of honor at the celebration. Then the time comes to go home. Masha says goodbye to everyone and leaves Confiturinburg. Dawn. Masha is still asleep on the sofa. Drosselmeyer sneaks up to Masha and carefully takes the Nutcracker out of her arms. He puts the diadem on her head and hides behind a column. Masha wakes up and ,not seeing the Nutcracker, finds the diadem on her head. Looking around she cries with obvious delight: «It was not a dream after all». The happy Drosselmeyer watches his niece with love and tenderness. The sleepless night wasn`t a waste of time. The diadem was really great.